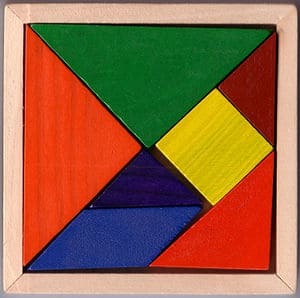 The tangram (Chinese: 七巧板; pinyin: qīqiǎobǎn; literally: "seven boards of skill") is a dissection puzzle consisting of seven flat shapes, called tans, which are put together to form shapes. The objective of the puzzle is to form a specific shape (given only an outline or silhouette) using all seven pieces, which may not overlap. It is reputed to have been invented in China during the Song Dynasty, and then carried over to Europe by trading ships in the early 19th century. It became very popular in Europe for a time then, and then again during World War I. It is one of the most popular dissection puzzles in the world. A Chinese psychologist has termed the tangram "the earliest psychological test in the world", albeit one made for entertainment rather than analysis. The origin of the word 'tangram' is unclear. The '-gram' element is apparently from Greek γράμμα 'letter'. The 'tan-' element is variously conjectured to be from Chinese t'an 'to extend' or Cantonese t'ang 'Chinese'. 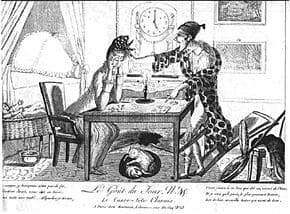 A caricature published in France in 1818, when the Tangram craze was at its peak. The caption reads: " 'Take care of yourself, you're not made of steel. The fire has almost gone out and it is winter.' 'It kept me busy all night. Excuse me, I will explain it to you. You play this game, which is said to hail from China. And I tell you that what Paris needs right now is to welcome that which comes from far away.' "
The tangram had already been around in China for a long time when it was first brought to America by Captain M. Donnaldson, on his ship, Trader, in 1815. When it docked in Canton, the captain was given a pair of Sang-Hsia-koi's (author) Tangram books from 1815. They were then brought with the ship to Philadelphia, where it docked in February 1816. The first Tangram book to be published in America was based on the pair brought by Donnaldson. 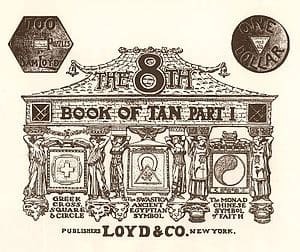 The puzzle was originally popularized by The Eighth Book Of Tan, a fictitious history of Tangram, which claimed that the game was invented 4,000 years prior by a god named Tan. The book included 700 shapes, some of which are possible to solve. The puzzle eventually reached England, where it became very fashionable indeed. The craze quickly spread to other European countries. This was mostly due to a pair of British Tangram books, The Fashionable Chinese Puzzle, and the accompanying solution book, Key. Soon, tangram sets were being exported in great number from China, made of various materials, from glass, to wood, to tortoise shell. Many of these unusual and exquisite tangram sets made their way to Denmark. Danish interest in tangrams skyrocketed around 1818, when two books on the puzzle were published, to much enthusiasm. The first of these was Mandarinen (About the Chinese Game). This was written by a student at Copenhagen University, which was a non-fictional work about the history and popularity of tangrams. The second, Det nye chinesiske Gaadespil (The new Chinese Puzzle Game), consisted of 339 puzzles copied from The Eighth Book of Tan, as well as one original. One contributing factor in the popularity of the game in Europe was that although the Catholic Church forbade many forms of recreation on the sabbath, they made no objection to puzzle games such as the tangram. Tangrams were first introduced to the German public by industrialist Friedrich Adolf Richter around 1891. The sets were made out of stone or false earthenware, and marketed under the name "The Anchor Puzzle". More internationally, the First World War saw a great resurgence of interest in Tangrams, on the homefront and trenches of both sides. During this time, it occasionally went under the name of "The Sphinx" an alternative title for the "Anchor Puzzle" sets. The seventh and eighth figures represent the mysterious square, built with seven pieces: then with a corner clipped off, and still the same seven pieces employed. The two monks paradox - two similar shapes but one missing a foot. The Magic Dice Cup tangram paradox - from Sam Loyd’s book The Eighth Book of Tan' (1903). Each of these cups was composed using the same seven geometric shapes. But the first cup is whole, and the others contain vacancies of different sizes. (Notice that the one on the left is slightly shorter than the other two. The one in the middle is ever-so-slightly wider than the one on the right, and the one on the left is narrower still. Clipped square tangram paradox - from Sam Loyd’s book The Eighth Book of Tan (1903). Over 6500 different tangram problems have been created from 19th century texts alone, and the current number is ever-growing. The number is finite, however. Fu Traing Wang and Chuan-Chin Hsiung proved in 1942 that there are only thirteen convex tangram configurations (configurations such that a line segment drawn between any two points on the configuration's edge always pass through the configuration's interior, i.e., configurations with no recesses in the outline). Of these seven pieces, the parallelogram is unique in that it has no reflection symmetry but only rotational symmetry, and so its mirror image can be obtained only by flipping it over. Thus, it is the only piece that may need to be flipped when forming certain shapes.